Kids who fuel up in the morning focus and concentrate better in the classroom and perform better on math, reading and standardized tests. Before you send your kids out the door and off to school, there may be something they’re missing—and it’s not their backpacks or lunches. 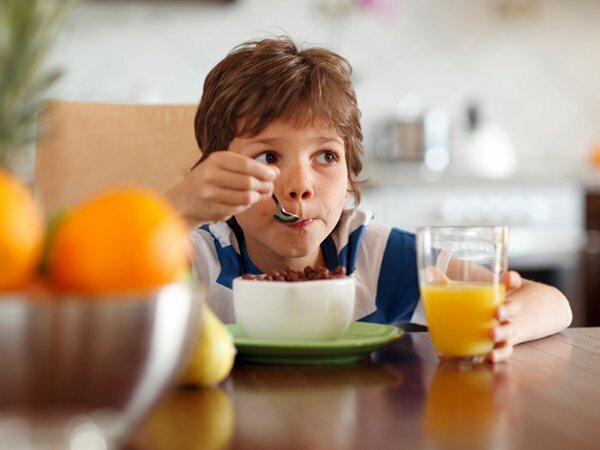 “Numerous studies suggest that schoolchildren skip breakfast more than any other meal of the day,” says Melissa Joy Dobbins, MS, RDN, a spokesperson for the Academy of Nutrition and Dietetics. “That means some kids go as long as 15 hours or more without food.” That doesn’t just leave their stomachs growling—it also impacts their ability to learn. Kids who fuel up in the morning focus and concentrate better in the classroom and perform better on math, reading and standardized tests. They also have fewer behavior problems and are less likely to be tardy. Conversely, the Academy’s The State of Family Nutrition and Physical Activity Report: Are We Making Progress? finds that even a child who is well nourished but skips breakfast can have problem-solving difficulties that are serious enough to lower their test taking ability. Nix late night noshing: Many kids aren’t hungry for breakfast because they snack at night. Try telling your kids the kitchen is closed after dinner and you’ll be surprised how much hungrier they are in the morning. Prep the night before: Getting breakfast on the table is tricky for most busy families. Setting the breakfast table at night can make your morning a little smoother. While you’re at it, why not put out a few boxes of whole-grain cereal for kids to pick and choose from? All they’ll have to do in the morning is pour and add milk. Start small: If your family doesn’t usually eat anything in the morning, it may take a while to develop the habit. Starting with a mini meal of yogurt topped with low-fat granola or a small slice of whole-wheat toast can make the transition easier. Set the alarm 10 minutes earlier: Hectic mornings can make it difficult for kids (and parents) to find time for breakfast. Waking up just a few minutes earlier provides time to squeeze in a quick morning meal. Dress first, eat second: Kids are more likely to feel hungry once they’ve had a chance to wake up. Make sure you’re well stocked: No time to cook? No problem. Quick-fix foods like whole-grain cereal, string cheese, berries, yogurt, whole-wheat toast, mini bagels and English muffins make grabbing breakfast a cinch.